On December 11th, we made arrangements for the Heartland Hospice Services. ​On October 15th, we completed the fall maintenance of the garden at Barns Brinton in Chadds Ford. ​On October 1st, we completed the fall maintenance of the welcoming garden at the entrance of Kennett Square. We made flower arrangements for the 11th Annual Vintage and Super Car Tour and Show at the Brantwyn Mansion in Wilmington Delaware to benefit the Kennett Symphony. On April 28th, the annual plant sale was held in downtown Kennett Square. The proceeds from the sale benefit Kennett Square Conservation and Beautification Committee. On March 28th and April 5th and June 9th, we participated with other area garden club to plant flowers in the street barrels in Kennett Square. On April 23rd, we completed the spring maintenance of the kitchen and herb garden at Barns Brinton in Chadds Ford. On April 13th, we completed the spring maintenance of the welcoming garden at the entrance to Kennett Square. On May 11th, we we provided materials and guidance to three and four year old children at Head Start in Kennett Square so they could make flower arrangements. On May 29th, we provided materials and guidance to three and four year old children at the Montessori School in Kennett Square so they could make flower arrangements. On December 12th, we made arrangements for the Heartland Hospice Services. ​On December 11th, we completed the fall maintenance of the garden at Barns Brinton in Chadds Ford. 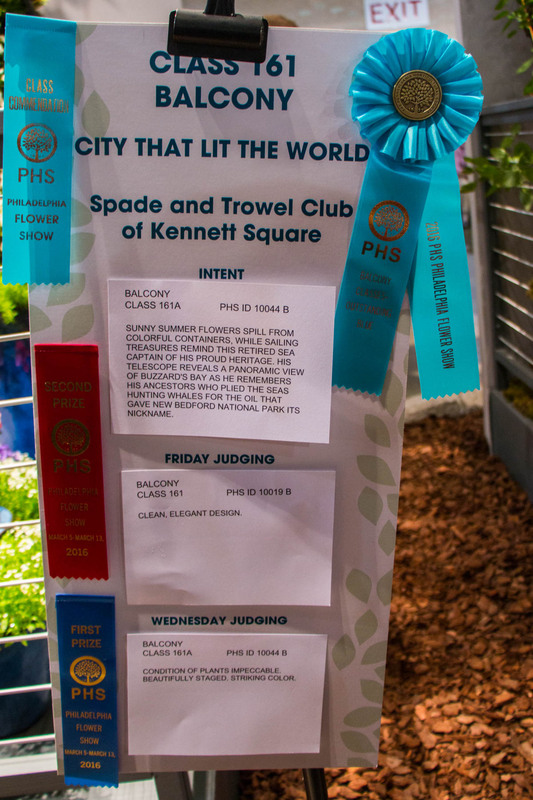 On September 23rd and 24th, Spade and Trowel, along with The Country Gardens, Four Season Garden Club, and the Garden Class of the Woman's Community Club of Uwchlan, sponsored a Flower Show at Longwood Gardens. Many of our members were involved as exhibitors and/or staffers. We made flower arrangements for the 10th Annual Vintage and Super Car Tour and Show at the Brantwyn Mansion in Wilmington Delaware to benefit the Kennett Symphony. On June 13th, the members of the club participated in "There's a CIRCUS in Town! ", a "Non-Standard In House Flower Show. On April 1st and June 10th, we participated with other area garden club to plant flowers in the street barrels in Kennett Square. On May 11th, we provided materials and guidance to three and four year old children at the Montessori School in Kennett Square so they could make flower arrangements. On May 5th, we we provided materials and guidance to three and four year old children at Head Start in Kennett Square so they could make flower arrangements. On April 29th, the annual plant sale was held in downtown Kennett Square. The proceeds from the sale benefit Kennett Square Conservation and Beautification Committee. On April 24th, we planted a variety of new perennials in the welcoming garden at the entrance to Kennett Square. On April 24th, we completed the spring maintenance of the kitchen and herb garden at Barns Brinton in Chadds Ford. On February 22nd, we completed the spring maintenance of the welcoming garden at the entrance to Kennett Square. On December 14th, we hosted a holiday tea for over 120 ladies at Oberod in Wilmington, DE. The tea featured sweet and savory treats served in the traditional English style. A collection of "must haves" from local artisans were available, along with items assembled by club members. On December 6th, we made arrangements for the Heartland Hospice Services. On November 22nd, June 13th and June 20th, we participated with other area garden clubs to plant flowers/greens in street barrels in Kennett Square. ​On November 1st, we completed the fall maintenance of the garden at Barns Brinton in Chadds Ford. We made flower arrangements for the 9th Annual Vintage and Super Car Tour and Show at the Brantwyn Mansion in Wilmington Delaware to benefit the Kennett Symphony. On June 9th, we participated in the Herbs and Potions Tavern Talks event held at Barns Brinton House. Since we maintain the kitchen and herb garden, we provided information/tours of the garden. On April 30th, the annual plant sale was held in downtown Kennett Square. The proceeds from the sale benefit Kennett Square Conservation and Beautification Committee. On April 25th, we completed the spring maintenance of the kitchen and herb garden at Barns Brinton in Chadds Ford. On April 14th, we provided materials and guidance to three and four year old children at the Montessori School in Kennett Square so they could arrange table centerpieces. On March 24th, we helped three and four year old children make Easter flower arrangements at Head Start in Kennett Square. On March 23rd we participated with other area garden clubs to plant flowers in street barrels in Kennett Square. On March 16th, we completed the spring maintenance of the welcoming garden at the entrance to Kennett Square. Click here to view our City that Lit the World balcony that was on display at the Philadelphia Flower Show,"Explore America: 100 years of the National Park Service". This retired sea captain's balcony displayed sunny summer flowers spilling from colorful containers and sailing treasures. His telescope revealed a panoramic view of Buzzard's Bay as he remembered his ancestors who plied the seas hunting whales for the oil that gave New Bedford National Park its nickname. 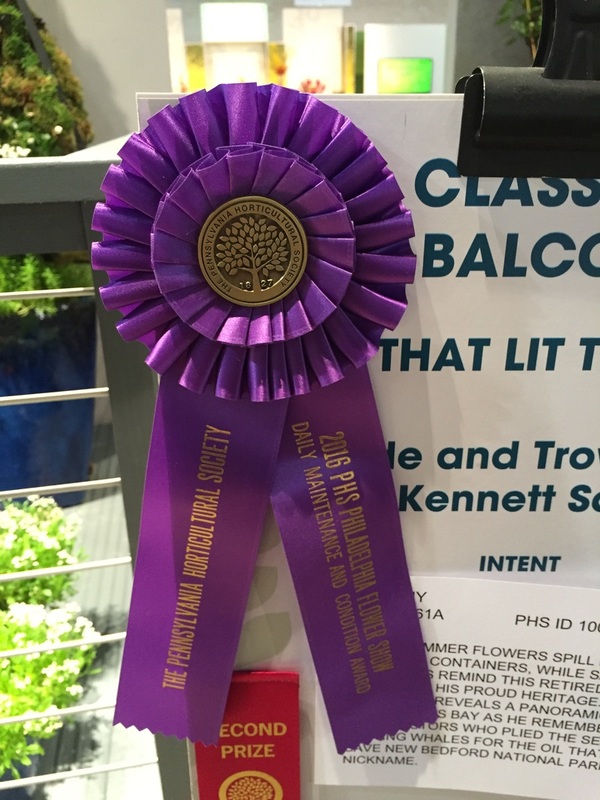 The Philadelphia Flower Show "first judging" earned us a Second Place Ribbon. 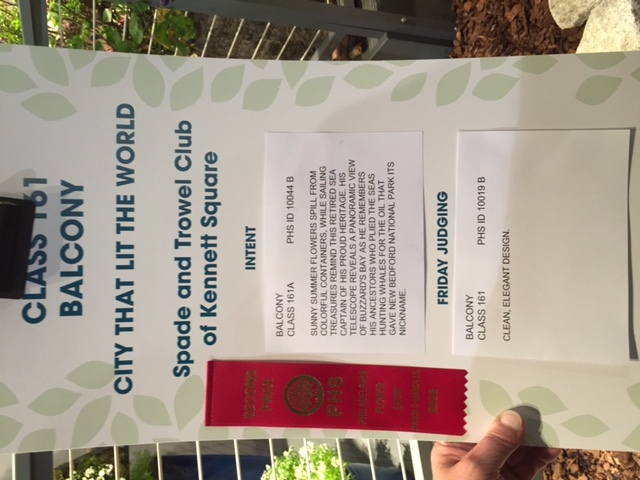 Then, the Philadelphia Flower Show "second judging" earned us a First Place Ribbon. We earned a Class Commendation for overall excellence across all four entrants in the Balcony Class. We also won a Maintenance Award for "impeccable" maintenance. Learn more in the Daily Local News article. Click here to view a picture of our exhibit published in the Daily Local News. On April 1st, May 30th, and December 12th, we participated with other area garden clubs to plant street barrels in Kennett Square. On December 8th, we made arrangements for the Heartland Hospice Services. ​On November 3rd, we completed the fall maintenance of the garden at Barns Brinton in Chadds Ford. We made flower arrangements for the 8th Annual Vintage and Super Car Tour and Show held on October 4th at the Brantwyn Mansion in Wilmington Delaware to benefit the Kennett Symphony. 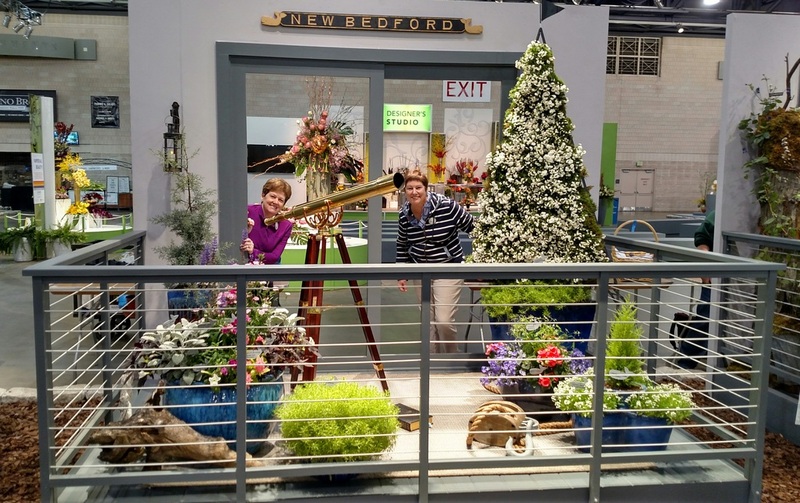 On September 19th and 20th, Spade and Trowel, along with The Country Gardens, Four Season Garden Club, and the Garden Class of the Woman's Community Club of Uwchlan, sponsored a Flower Show at Longwood Gardens. Many of our members were involved as exhibitors and/or staffers. Once the members of the Chadds Ford Historical Society and students reconstructed the flower beds in Barns Brinton, we replanted the Kitchen and Herb Garden. On April 6th we completed the spring maintenance of the welcoming garden at the entrance to Kennett Square. On April 15th we provided materials and guidance to three and four year old children at the Montessori School in Kennett Square so they could arrange table centerpieces. On April 25th, the annual plant sale was held in downtown Kennett Square. The proceeds from the sale benefit Kennett Square Conservation and Beautification Committee.